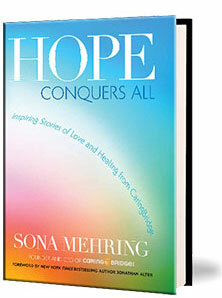 In 1997, Sona Mehring created the first CaringBridge website when a close friend endured a life-threatening pregnancy. CaringBridge is now the leading website for rallying support during a health journey – one in nine people in the U.S. have used CaringBridge. Through CaringBridge, Mehring has witnessed thousands of stories of hope and connection among people struggling with stroke, cancer, and other life-changing conditions. Hope Conquers All shares some of her most touching stories. Hope Conquers All contains stories from people of all ages and backgrounds. The adversities they face vary greatly, from children with cancer, to adults requiring life-saving transplants, to victims of horrific accidents, but their stories are unified—hope does conquer all. And CaringBridge is a place where hope grows. It’s a website that helps people reach out and stay in touch through moments of great need. It inspires them and instills hope; it helps foster and encourage much-needed emotional connection. These intimate personal stories, which reveal the underlying spiritual presence that connects us all, will encourage people to create channels of love and support in their own lives. Heather Sharp, author of Why Did I Survive? Karla Blackwood, CaringBridge user and one of "The Girls from Ames"